The music is just splendid. I will open up the soundtrack on Spotify and love them for it. There is a lot to unpack with this movie. I watched it with Daughter and Husband. We discussed how all it takes is a chance meeting and then you are on SNL. Lady Gaga has such amazing raw talent. Their song Shallow that is up for an award – I hate the chorus. Love the rest of the song but the chorus makes me cringe a little. Overall, the music was truly amazing and worth a listen. That Bradley Cooper sang his own stuff is crazy. My heart aches for Bradley Cooper’s character, Jack. I have nerve damage in my left ear. The noise they would play when listening “through Jack’s ears” is what I listen to all the time, every day all day. When I am tired or when I lay on my right ear, that noise drowns out the world to me. The scene where he is trying to talk to his brother Bobby (Sam Elliott) back stage and he cannot hear him – that is my life. The character of Jack was a raging alcoholic who attempted suicide at the age of “just shy of 13” and was popping pills like tic tacs. There is the almighty dollar at play but when do labels, handlers or agents step up to take responsibility and put their foot down with a “you are not allowed to work until you are sober”? There is no way possible that (even in real life) that people who abuse ALL the substances to that extent fly under the radar of those who make money off of them. The suicide bothered me tremendously. At that point I had devolved into a hot mess puddle of tears. If you are sensitive to that issue, then you should think twice before watching. I believe there should be some sort of disclaimer at the beginning so people can make the choice of whether they want to see a movie that includes a suicide or not. Categories nominated in: Best Picture, Screenplay, Cinematography, Sound Mixing, Original Song, Actor, Actress and Supporting Actor. Best Picture – I believe it should have a decent shot. I don’t think it will win, but it deserves to be in the category. Original Song – I think the Academy will follow the lead of the Globes and give it to them. It was not my pick but that does not mean I think the song is bad. It just was not my favorite. Actor – I would support Cooper as best actor. Actress – Gaga is solid, just not my choice. I WANT SAM ELLIOTT TO WIN SUPPORTING ACTOR. I know he will not but it would be cool AF to see. IMDB Synopsis: A musician helps a young singer find fame, even as age and alcoholism send his own career into a downward spiral. I rank this movie a 97.85! It received a Rotten Tomatoes rating of 90% Fresh. It received a Rotten Tomato audience rating of 80% liking it. Average Rating: 4.1/5 with a number of User Ratings: 16,754. Majority of the drag queens’ scenes were unscripted and improvised. They originally had little dialogue but seeing that their candid jokes added so much entertainment value, Bradley Cooper decided to extend them and let them play around on their own. Willam Beli, the drag queen that played Crystal, even claimed that none of her original lines made it to the final cut and that all her scenes in the movie were out of improvisation. During one of Lady Gaga’s concerts at Fenway Park in Boston, microphones were placed around the stadium and fans in attendance were encouraged to chant her character Ally’s name for use in the film. Ally’s father in the film was imbued with real life aspects of Lady Gaga and her father’s relationship. The scene when Ally talks to her dad about how many times he carried her piano up the stairs and sat with her while she wrote songs reflects the same genuine moments shared between Lady Gaga and her father. Sam Elliott claimed that after he accepted the role of Bobby, Bradley Cooper revealed to him that he had already spent months of work with a dialect coach studying Elliott’s voice as a model for Jackson Maine. The choreographer in the movie is Gaga’s real life choreographer, Richy Jackson. The two principle drag queens, Willam Belli and Shangela Laquifa Wadley, both competed in separate seasons of RuPaul’s Drag Race, a show which Lady Gaga once judged. Gaga appeared on the judging panel during the first episode of season 9, Willam competed on season 4 and Shangela on seasons 2, 3 and All Stars 3 respectively. The dog Ally gets for Jackson is Bradley Cooper’s actual dog Charlie. 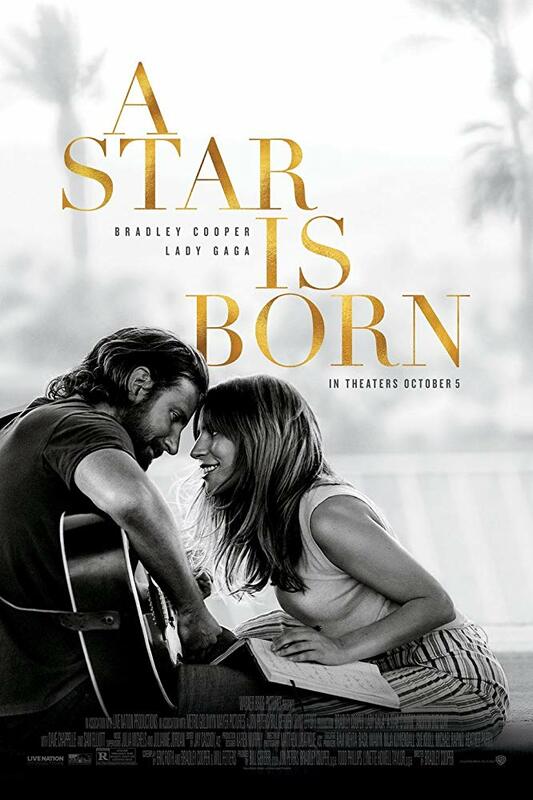 2 bars of the song: I’ll Never Love Again’s opening piano motif is actually played throughout the film. The first time is when Jackson is lying in bed after performing Shallow and passing out drunk with Ally by his side. The second time, Ally plays the same motif on the piano after finding out about Jackson’s suicide. In the scene where Ally (Lady Gaga) is doing a photoshoot and finds out that she’s nominated for three Grammys the song “New York I Love You But You’re Bringing Me Down” by LCD Soundsystem can be heard on the background, this may be a reference about how Gaga’s character had to change in order to become famous.